“To Know, To Love, To Inspire.” A Poem By Donald Andre Bruneau. He helps me to know His people. He accompanies me, with compassion. from room to room, the patient and I are blessed. as I visit the sick, the hurting. my ears, my hands; my joy overflows. for endless years to come. “To Know, To Love, To Inspire.” Is a poem I wrote in 1999, during my four years of studies at Saint Paul University in Ottawa, Ontario, Canada. At the time I was doing my practicum to become a Chaplain and was visiting patients in the hospitals. Little did I know that immediately after my graduation with a Master of Pastoral Theology, I would be called to be my mother’s Power of Attorney and caregiver for the next nine years in a nursing home. Well, this was my ‘golden opportunity’. In those nine years, the ‘Holy Spirit’ showed me what ‘true love’ is, and the Holy Spirit which is source of God’s Love—“And hope confoundeth not: because the charity of God is poured forth in our hearts, by the Holy Ghost, who is given to us.” (Romans 5:5)—was poured into my heart.. I sought and obtained a greater and greater infilling of God’s Holy Spirit through my daily attendance at Mass, my hearing and reading and contemplating God’s Holy Word and a life of prayer, especially the prayer of the Holy Rosary. 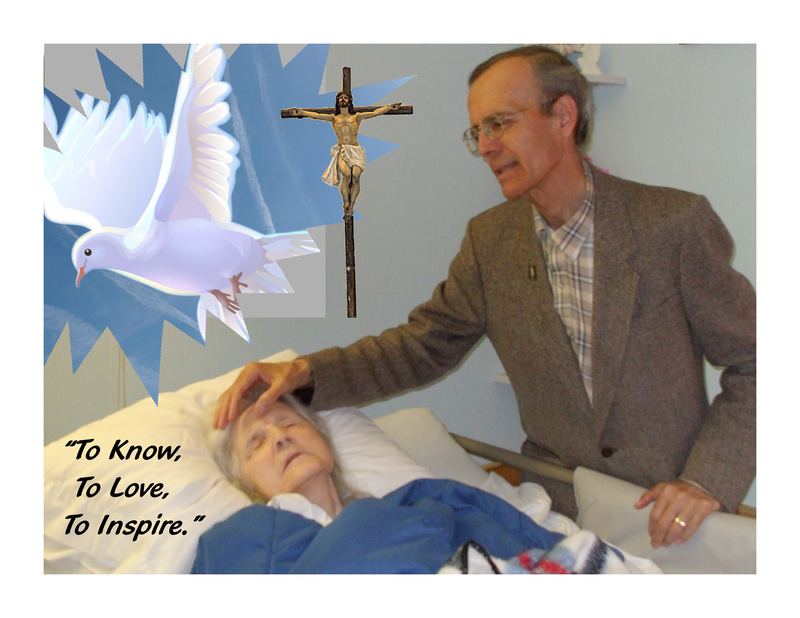 During those nine years in my daily visits with Mom in the nursing home I learnt so much about God’s unconditional love. I discovered the love that God the Father, God the Son, and God the Holy Spirit have for each and every one of us, God’s creatures. 21 That they all may be one, as thou, Father, in me, and I in thee; that they also may be one in us: that the world may believe that thou hast sent me. 22 And the glory which thou hast given me, I have given to them: that, they may be one, as we also are one. 23 I in them, and thou in me: that they may be made perfect in one: and the world may know that thou hast sent me and hast loved them, as thou hast also loved me. 24 Father, I will that where I am, they also whom thou hast given me may be with me: that they may see my glory which thou hast given me, because thou hast loved me before the creation of the world. 25 Just Father, the world hath not known thee: but I have known thee. And these have known that thou hast sent me. 26 And I have made known thy name to them and will make it known: that the love wherewith thou hast loved me may be in them, and I in them. In this present ‘Culture of Death’ which is explained here…(cf: http://www.aborterrorism.ca/your-worldview-will-it-bring-life-or-death-to-the-unborn-baby-and-to-yourself-2 ) you will see that the ‘Culture of Death’ permeates and ‘affects’ every aspect of our lives, from the moment of conception to our natural death. This world is in drastic need of God’s love. We need God’s Holy Spirit like never before, in order to combat the ‘Culture of Death’ with the ‘Culture of Life’. Through the ‘Birth control Pill’ and ‘abortion’ the Culture of Death is doing its ravages daily—its motto—“Me, Myself, and I”—“My Body, My Choice”—“Total Indifference to Others” –‘Total selfishness and self-centerednesss”. God’s love manifest by the Holy Spirit through his children is the total opposite of the spirit of death of the ‘Culture of Death’.. In John 3:16 we see so clearly God the Father’s Love for us through his Son Jesus Christ in order to grant us ‘eternal life’. Our God is a God who ‘gives, and gives, and gives’ so that we may have ‘life’ and ‘Life more abundantly’. In John 10:10 we see the choice that is to be made. If we choose to be part of the ‘Culture of Death’ the thief, the devil, will steal, kill and destroy us. If we choose to follow Jesus, who is the “Way and the Truth and the Life’ we will have life and life more abundantly. God ‘gave’ us the Virgin Mary, Saint Joseph, Jesus, his Holy Spirit, his Holy Word, his Catholic Church, his Saints, etc…all of this so that one day we may be in Heaven in His Kingdom of Love. Meanwhile with the power of the Holy Spirit we will joyfully set out “To Know, To Love, To Inspire”. I encourage you to seek the Holy Spirit, to be filled with God’s Love. Do the following “Novena to the Holy Spirit”, experience God’s love like never before and then answer the call to love God and neighbour and fill this world with ‘Love and Life’. Strive for Heaven Now! Click on the following to begin the Novena to the Holy Spirit.